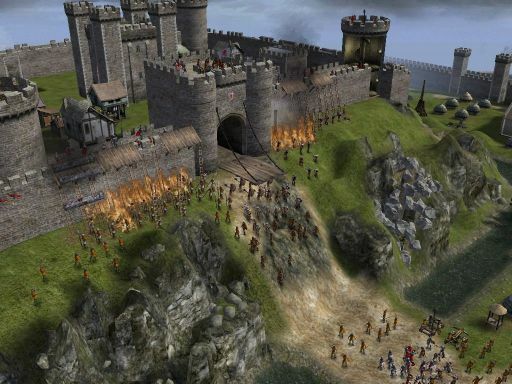 The castle-sim and siege-warfare RTS sequel Stronghold 2 at last brings the series to life in full 3D. The King, having fled after the defeat of his armies, now attempts to rule his country from a secret location. It is not known if he is even in the country anymore. Now, powerful barons jostle for what is fast becoming a disintegrating kingdom. It is up to you to stem the tides of their ambition and unite the land under the King once again. Expand your lands while you build and fortify your citadel. Entertain with jousts, lavish feasts and tournaments or rule with an iron fist and dispense medieval justice to your overworked and slovely peasants. Strong hold 2 is billed as the most accurate, amazing and dynamic depiction of siege-warfare and castle-life every portrayed. The game offers players a “castle-life” campaign, enhanced multiplayer capability and a new, innovative redesign of the single player campaign.